Coolred's Rant: Some Stickers Just Say It All!! Some Stickers Just Say It All!! 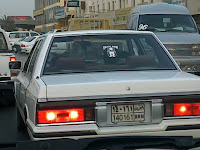 I was stuck in traffic yesterday and found myself behind this car for quite some time. As we didnt actually move AT ALL for maybe 15 min I didnt take much notice of the driver himself/herself...until we did actually start to move...then I was like...IS there a driver in that car?!! I mean seriously...can you SEE anyone sitting there? I told my friend to check it out and she was craning her neck trying to get a look see but we were hard pressed to see any movement or indication that someone was driving that car. Did they get fed up in traffic and just abandon it? I know thats something Ive felt like doing more than once. Now the truly funny thing about this whole matter was the sticker on the back window. I think you can just see it there...click on it for a closer view. I felt it caught the whole experience down to a tee. Unfortunately I was unable to take a pic of the driver...and yes there was one...a very old very tiny man who was literally stretched out...or rather up...in order to see out the window while he was driving. Apparently while we werent moving he just relaxed and sat back...and disappeared from view. There was also a young child in the passenger seat...no seat belts...sigh. Now I will never tell someone they are not fit to drive etc...obviously the traffic department figured he was good to go (assuming his license hadnt expired) but I figure if your having such a hard time seeing out the front window, a very necessary requirement far as Im concerned...especially if I happen to be anywhere near you...then the very least you could do is put a pillow or something under your bum and lift you up to a proper height so you can see unencumbered...yes? 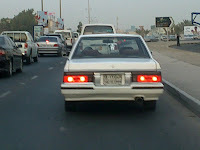 Just one more reason driving in Bahrain should come with hazard pay and plenty of pain killers. hmm, death row, huh? for who, the child with no seatbelt on? Hahahaha! Sometimes hubby does go thru' a similar experience.And you know how men talk about women driving! That's a very nice photo of you. I'm happy you're back and well! Have a fantastic weekend. Be happy! Lol thats funny! You should take more pics of Bahrain for those of us who don't live there. I personally whould love to see the streets buildings etc! You don't have to like or agree with my thoughts...but you also don't have to stick around to read them. Give Me A Family ...Please? I've got my eye on you people!! !